Undocumented family records tell me that my third great-grandfather, William Doyle, died in 1844. Neither a specific date nor a location came with that information. When I didn't find William in the 1841 U.K. Census with his wife, Martha, and their children, I began searching for an earlier death record for him. Both FamilySearch and FreeBMD have online indexes available and FreeReg has transcripts of some parish records. When a result at FamilySearch led me to the man who was probably my grandfather, I ordered a death record from U.K. GRO. This is the record I received for William Doyle, Pitman. It is U.K. GRO reference Year 1838, Volume 25, Page 149, Line 26. 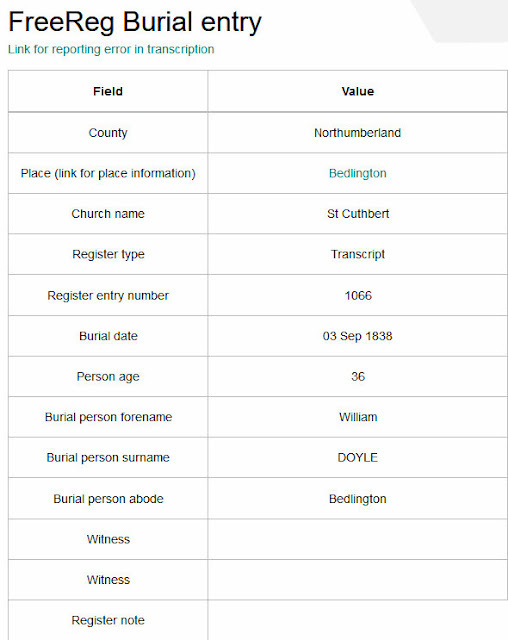 When I searched for William at FreeReg I found transcribed burial information. It tells me that William Doyle, age 36, was buried at (or from) St. Cuthbert Church, Bedlington, Northumberland, on September 3, 1838. Having searched the U.K. GRO online registry I found no other William Doyle who could possibly have been mine. That leaves me fairly confident that this is my grandfather. However, I would have been happier about the death record if William's wife, Martha, had been the informant instead of the coroner. Though William died in Ponteland he was buried in Bedlington. The distance between the two is about 10 miles by today's roads. I had hoped that I might at least learn the name of his father and his birthplace, especially since he does not appear in any U.K. Census record, though I knew it was a slim possibility based on the GRO's guide to death certificates. William's age at death helps me determine that he was born about 1802. That's a starting point for further research, though lacking a location will be a detriment. He died after being run over by a cart wheel. How sad. I wish for details. Was it a coal cart? Was it full or empty? Did that happen inside a coal mine, outside near a coal mine, or elsewhere? Might there be a newspaper article about his death? Of course, I have more research to do. At the very least I'd like to obtain a copy of the parish record for his burial. And what other records might give his birth location and the names of his parents? To date I have not found a parish record for his birth but even if I did, how would I know for sure it was his? Ah, the challenges.